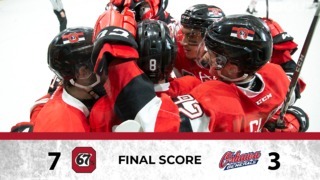 After winning the Alexandra Cup in a home-and-home series against the Gatineau Olympiques last weekend, the 67’s didn’t have much time to celebrate, hitting the ice the following afternoon and defeating the Peterborough Petes 4-2. Tye Felhaber continued his season-long hot streak with six goals last weekend, including a hat trick in the second game against Gatineau. Felhaber leads the OHL in goals with 35 in 32 so far this year. Felhaber and his teammates will be shorthanded this weekend with forward Sasha Chmelevski, who has 24 points in his last 11 games, on his way to Team USA World Junior camp. Mikey DiPietro, who won his first start since being acquired from Windsor, is also away at Team Canada camp. 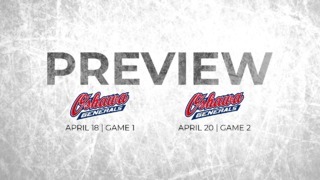 This weekend’s slate of game sees Ottawa host the Flint Firebirds and Owen Sound Attack on Friday and Saturday, followed by a trip to visit the Peterborough Petes. When they visited the Flint Firebirds in their trip south of the border back in November, Austen Keating and Felhaber both had three-point nights. In a 4-3 win over Owen Sound at the start of the season, goaltender Cedrick Andree made 41 saves to lead his team to a win, while Keating set up two goals. Having a win and a loss against Peterborough so far this year, the 67’s cannot look ahead of themselves before their final game ahead of the Christmas break. They will look to repeat what they have done this past Sunday in order to go back home with a smile on their faces. With only one win in their last 10 games, it’s easy to overlook Flint, but this is the type of matchup that can be considered a ‘’trap game”. As if things weren’t already difficult enough for the Firebirds, they will be without their best player Tye Dellandrea for this game, as the Dallas Stars first rounder is away at Team Canada World Junior camp, so the team will look for leading scorer Jake Durham to lead the way. It could be a tired Flint team that makes its way to TD Place on Friday, as they will be playing Thursday night in Peterborough. The last time these two teams met back in early November, the Barber Poles scored seven goals in a 7-4 win on the road. Seventh overall in the OHL standings, Owen Sound will present a challenge for the 67’s in their annual Teddy Bear Toss game. The Attack will also be without a key piece for this game, as captain Nick Suzuki is also at Team Canada World Junior camp. The Attack will still be able to count on top scorer Kevin Hancock for this game, and he’ll be the player to watch for the 67’s. Hancock has put up 53 points in 31 games this year and is tied for the OHL’s third leading scorer. 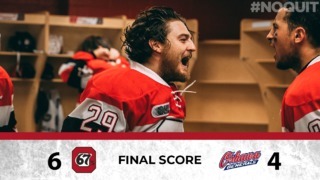 This game will mark the return of ex-67’s defenceman Carter Robertson to The Arena at TD Place for the first time since he was traded before the start of the season. In 31 games with the Attack, Robertson has a goal and six assists for seven points this season. The game starts at 2 p.m. Fans are encouraged to bring a new or gently used stuff toy to throw onto the ice when the 67’s score their first goal. Standing at third in the East Division, the Peterborough Petes will be waiting for the 67’s with their foot down on Sunday afternoon, especially due to the fact that they will have their recent loss to the 67’s fresh in their memories. It was only last Sunday when the 67’s defeated the Petes by a score of 4-2, in a game where Tye Felhaber had 2 goals and an assist. Players to watch on the Petes are definitely Russian forwards Semyon Der Argutchinsev and Pavel Gogolev. However, leading the team in points is Winnipeg Jets’ fifth rounder, defenseman Declan Chisholm, who has put up 28 points in 30 games this year. In nets, Peterborough counts on one of the best goaltenders in the OHL in Hunter Jones. Jones has 16 wins so far this year, with a GAA of 2.72 and a save percentage of .921. With 35 goals in 32 games, 67’s forward Tye Felhaber is on pace for a 74 goal season. With Sasha Chmelevski away at Team USA World Junior camp, the 67’s will need someone to step up offensively to fill in for their number 8. Chmelevski had 24 points in his last 11 games for the Barber Poles. With Michael DiPietro gone at Team Canada camp, Cedrick Andree will likely get at least two starts this weekend. Andree leads the OHL in wins with 20. The 67’s powerplay is currently sitting at 9th in the OHL with a 21.5 % conversion rates (25 for 116).